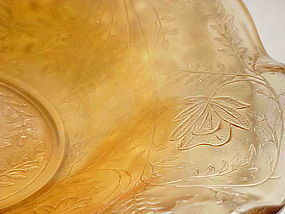 Vintage marigold carnival glass color, ruffled round bowl in the Louisa Iridescent pattern more commonly known as Floragold. This was manufactured by Jeanette Glass Company around the early 1950s. It has a pretty lacy leaf and feminine floral pattern. The inside of the bowl is smooth while the outside of the bowl you can feel the pattern. This lovely bowl measures 9½ inches in diameter 2½ inches tall and is in wonderful vintage condition with no noted chips, cracks or repairs. I have 5 in this size. Price is per bow, and all are perfect. I will be listing the matching large size too.